Regulatory Technology aka RegTech has been branded the new FinTech. It aims to help companies dealing with financial regulations and covers a wide range of applications: From reporting to monitoring to gap analysis or basically anything where innovation can find ways to present cheaper or faster solutions. One area that has been seems ripe for disruption is client on-boarding since it is still very dependent on manual intervention and thus time and cost intensive. Muinmos is a RegTech start-up that tackles this problem. We spoke to Remonda Z. Kirketerp-Møller, the company’s CEO & Founder RegTech and what it takes to create a great product from a simple idea. Remonda, can you tell us about yourself, your background, and your education? I have a background as a lawyer in financial services, having started my career in a law firm in London. I later moved in-house into banks and financial firms in Denmark and London where I was heading the legal, regulatory and compliance functions. I have a degree in law from the University of East Anglia in the UK, as well as European law from the Catholic University of Leuven in Belgium. I am authorised and regulated by the Solicitors Regulation Authority of England and Wales, and a member of the Danish Bar and Law Society. What can you tell us about Muinmos? muinmos was founded in 2012 when I realised that there was a huge gap in the market which no provider has resolved. It was born out of pure frustration, given that doing business in the financial sector was simply becoming a nightmare, and time to market was becoming extremely inefficient with the growing amounts of regulation and lack of any form of automation in this part of the on-boarding process. For me, it was a tough decision to leave what I had built behind in my previous positions and start from scratch, not quite knowing where it was heading other than the fact that I was convinced that someone needed to resolve this headache. 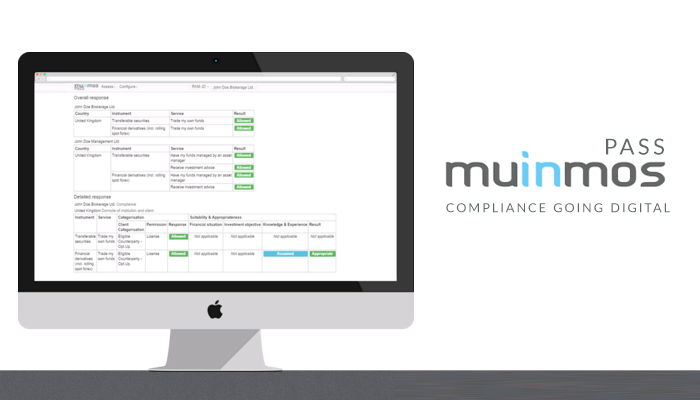 muinmos has developed PASS – a revolutionary cloud based platform which enables financial institutions to secure its continuous regulatory compliance, and within seconds determine whether a client from a particular country can trade in a service and given instrument type, and if the service and instrument type is suitable and/ or appropriate for the client in question in accordance with global regulations. This naturally significantly shortens the time of commencing a business relationship and opens up new opportunities for financial institutions in their provision of financial services across the globe. It also protects financial institutions by staying up to date with regulation, thereby avoiding potential huge fines, compensation of clients, reputational and operational risk. 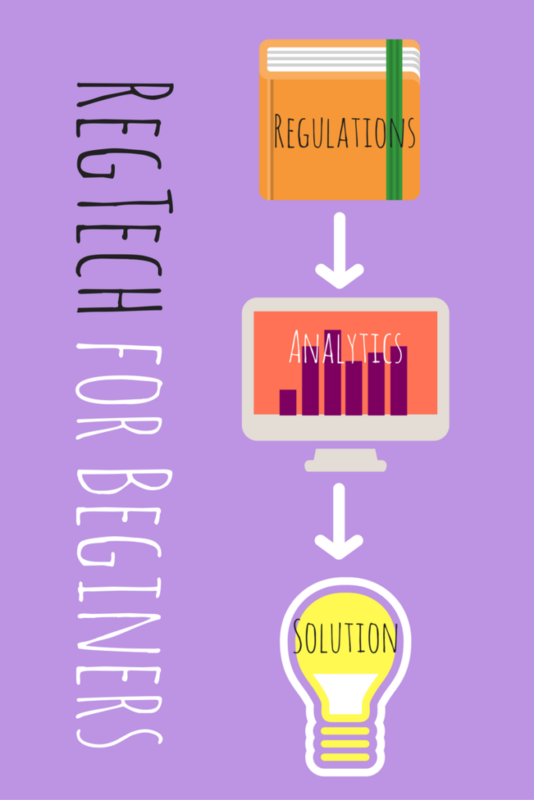 RegTechs try to help companies dealing with financial regulations in many ways. Where do your products and services fit in? muinmos PASS facilitates the first part of the on-boarding process. 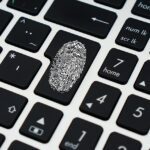 The second the financial institution brings in a potential client, before it spends any effort, money, and time doing the KYC clearance – it needs to ensure that it can in fact on board the client by clearing the regulatory steps in the first place. We cover the first part of the process, where we clear the jurisdictional part depending on where the client and financial institution are domiciled; we fully categorise the client, we clear the full suitability and appropriateness tests of each and every service and product the client is offered by the financial institution. We also keep full check on any regulatory changes, which means that the financial institutions will be notified on any regulatory changes impacting their client- or lead base 24/7. The attempt to apply technology to legal and regulatory processes is not new though. 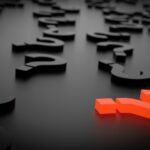 What is all the hype surrounding RegTech about and why now? To be frank having worked in the sector for over 14 years now, very little automation has been made to the on-boarding and compliance functions of financial institutions and very little is available on the market in terms of technological automation other than for the KYC part. So the hype is simply a crying need from the market and companies like ours are trying to actually resolve their pain. The continued increased frequency of changes to regulation globally has made it more and more difficult to remain compliant. 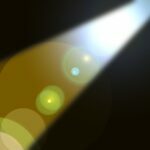 What are the key drivers of innovation and change in RegTech right now? The market is the biggest driver, financial institutions simply cannot cope with the sheer volume of regulation whether their business is focused locally or internationally, the changes are severe and so is the amount of regulation. 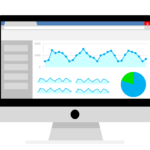 It is virtually impossible to keep up with this type of data unless you have an army of lawyers, both in-house and external. Next to that, obviously technology can drive the innovation in the financial sector too, but more than anything it is the mind-set of the traditional way of doing business that is being challenged by new incumbents or – as in muinmos’ case – a new way of looking at the challenges facing financial institutions. What are the biggest challenges to overcome? Changing the way the market actually does this today. It is extremely reliant on people and in-house teams, and for the teams to realise that a machine is ultimately taking over their position is quite tough for some, and many do not welcome automation in this sector as these teams have become extremely large over the years and going from x number to a few is a tough realisation. Regulators can be seen to take different approaches to RegTech, some seeking to collaborate more actively with the firms in the field than others. From the perspective of a RegTech firm, what does the collaboration with regulatory authorities look like and which role should regulators play in the process? We have excellent relationships with the regulators across the globe. Many of the regulators are trying to help the market remain complaint. So for us, we have actually seen a lot of the regulators welcome our offering since they too could see the benefit of ensuring that the financial firms are compliant at all times whilst also protecting the underlying investors. The UK FCA has focussed significantly on this the past period and is certainly welcoming new technology and new ways of doing business. PASS would also fit very well as a tool to be used by the regulators themselves- there is no product which automatically updates changes to cross-border regulation, and regulators would only benefit from this. 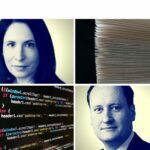 What will RegTech mean for regulators? Are we going to see a change of how regulations are developed and what is the future of financial regulation? Yes, I strongly believe that in the near future we will see less regulation as the market develops more and more automated solutions enabling the market to fully comply with ease. I also believe that many laws in the future would be drafted differently, and in a more constructive manner with reliance on technology tools to also assist regulators in audits across the chain. Muinmos was founded in 2012. Four years on, how do you create a successful start-up from a great idea in fintech? If you worked in a sector for many years and wake up every morning during those years asking yourself one question, why on earth was this not done by anyone before when every single financial institution on a global scale needs it, then you know you are on to something very unique. From your personal experience, what are the qualities of a great team? Strong drive in wanting to make a difference coupled with passion for change and a good sense of humour! How would you define your company’s approach to innovation? muinmos is the only company in the world offering what we do, so in that sense everything we do is innovative. But going forward I think it is important to always be inquisitive and question why we do what we do – it is in this place that innovation lies. What’s the most important lesson you learned building Muinmos? That obstacles are not just around the product but also the mind-set – clients need to see the immense benefits that can be achieved if they are willing to change the ways they do business. So to persuade the traditionalists can also be a challenge. Conquer the world and establish key partnerships that complement our product suite, as well as deploy PASS in brokers and banks around the world directly, so they can benefit from what is a game changer in the industry.